"They handed me you guys as a present, a regular Easter basket, and they told me to get you into some kind of shape so you could handle a little piece of this war. And that's what I'm gonna do. And that means I'm gonna tell you what to do, every day, and every minute of every day. I'm gonna tell you how to button your buttons. I'll even tell you when to blow your noses. And if you do something I don't like, I'm gonna jump. And when I land, it'll hurt. I'm gonna ride ya 'til ya can't stand up. But when you do stand up, you're gonna be Marines." While just about anything can spark the idea for a movie�a novel, a play, a true story�I'd venture a guess that Sands of Iwo Jima is on a very short list of movies whose genesis comes from a single photograph. I'm not hardly giving away the store by saying that the whole movie builds to a re-creation of that famous moment, the hoisting of the Stars and Stripes on Iwo Jima by the U.S. Marines, after an especially fierce battle in the Pacific theater during the Second World War. (The moment is memorialized in a statue in Washington, D.C.) It takes a while to get there, but it's a pretty rousing journey. There's no nuance or exceptions to the patriotism on display here�the opening scroll, for instance, dedicates the movie "to the United States Marine Corps, whose exploits of valor have left a lasting impression on the world and in the hearts of their countrymen." The picture may be made in black & white, but there's no question that the principal colors on display are red, white and blue. Welcome to Guadalcanal, recently taken from the enemy, and meet your new sergeant, one John M. Stryker. Stryker, played of course by John Wayne, is the archetypical tough but fair military lifer, whose mission it is to turn boys into Marines. ("If you can't learn the easy way, you'll learn the hard way.") The Louis Gossett role in An Officer and a Gentleman, and pretty much every hardass drill sergeant in cinema history, owes a debt to Wayne's character here. Stryker can be rough, but he's got his soft side, too: when one clumsy Marine just can't master his rifle, Stryker helps him out by putting the appropriate moves to the Mexican Hat Dance. Stryker's men are the usual assortment, with particular emphasis placed on their ethnicity: one soldier is of Greek descent, another is Jewish, another comes from Norwegian stock, and so on. (Conspicuously absent, of course, are black soldiers, or Marines of German, Italian or Asian ancestry.) There's also the son of the military man�in this case, Conway, played by John Agar, who was pressed into the corps only by family demands. Stryker served with Conway's old man, but the boy wants nothing to do with his dead father, or with stories about him. (He's sort of an unironic Lieutenant Dan from Forrest Gump.) The lengths to which Conway will go to distance himself from his old man borders on comical�when, for instance, he talks about having a son of his own, he promises: "I won't insist that he read the Marine Corps manual. I'll get him a set of Shakespeare." The story is structured around two huge battle sequences: the first is the assault on Tarawa, the second, of course, on Iwo Jima. On these two tentpoles are draped serviceable storylines for each of the soldiers: Stryker gets blindly stinking drunk because his wife ran out on him, Conway meets a girl at the U.S.O. and soon marries her, and so on. (Even though this portion of the movie supposedly takes place in New Zealand, neither the new Mrs. Conway nor anybody else sounds remotely like they're from anywhere but Southern California.) Many of the staples of World War II movies are on display; mail call, the dance at the U.S.O. (with a sign: "FREE CIGARETTES FROM THE FOLKS BACK HOME"), the dying words of Marines encouraging their comrades to fight on, and a last "tell my wife I love her." The film is always concerned with bravery, particularly in a battle sequence in which two Marines are killed because a third, dispatched for more ammunition, stops for coffee. (Not to make light of men dying in battle, but I couldn't help but think of how this would be remade, badly, today: death by Starbucks.) The enemy, of course, is portrayed in a manner that today would be termed politically incorrect: the Japanese soldiers are faceless killing machines, and are routinely referred to as "lemon-colored characters" and disparaged by other slurs (one Marine re Stryker: "I don't know which I hate worse, him or the Nips"). These things are always a little tough to hear, but Sands of Iwo Jima, made in 1949, doesn't have the excuse of it being wartime. It's a bit of authenticity that hasn't aged at all well. You may be surprised to find some absurdism on display ("That's war, boy." "What's war?" "Trading real estate for men"), but all this is dwarfed of course by the presence of John Wayne, Hollywood's idea of the ultimate military man, and the military's idea of one, too. He's a swaggering and charismatic here, and you can see why he became such a powerful symbol of Americanism to so many. Image Transfer Review: A number of nasty scratches and hunks of debris spoil some of the otherwise sharp black & white photography. The filmmakers tried to lend authenticity to the story by intercutting a good amount of documentary footage from the war, and while it's effective (no doubt Spielberg looked at this, or stuff much like it, when preparing for Saving Private Ryan), it serves as a counterpoint for the artificial, pretty images captured by Hollywood cinematographers. Audio Transfer Review: The mono track sounds pretty crisp, though the volume level on the battle sequences vary considerably. And pop the remote over to the Spanish track every now and again, just because it's a kick to hear the Duke dubbed by a Ricardo Montalban soundalike. Extras Review: If it feels like the feature is pretty much the longest, most elaborate Marine Corps recruiting film ever made, there's a good reason for that: that's pretty much how Sands of Iwo Jima was conceived. This is one of the many informative little nuggets offered up in the accompanying documentary, The Making of Sands of Iwo Jima (17m:48s), produced in 1993 and hosted by Leonard Maltin. Apparently in a bit of postwar budget scrutiny, Congress was considering eliminating the Marine Corps altogether; their top brass appealed directly to John Wayne to make this picture. Interviewees include cast members Richard Jaeckel, Wally Cassell, Forrest Tucker, Richard Webb and John Agar; the Marine officer assigned to the production, which was shot at Camp Pendleton, near San Diego; and Wayne's son, Michael. The original trailer blares out that the cast features Wayne, the rest of the leading actors, "and the gallant United States Marines!" 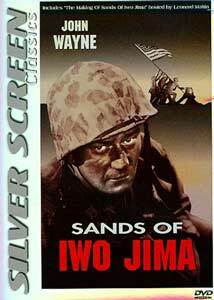 Sands of Iwo Jima is a rousing World War II picture, one of the first bits of war nostalgia offered by Hollywood, and it's easy to understand why it was such a hit. John Wayne is a towering presence, and when he's got motivated men under his command and the Marine Corps hymn blaring from the soundtrack, stay out of their way.